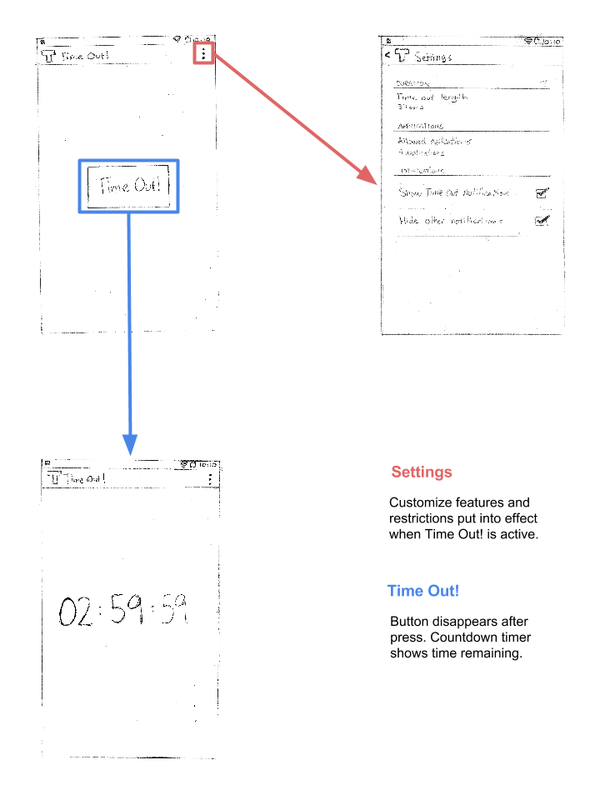 ABE + ITP: Wireframing an app: Time Out! Time Out! is a proposed app that helps you get away from your mobile device. 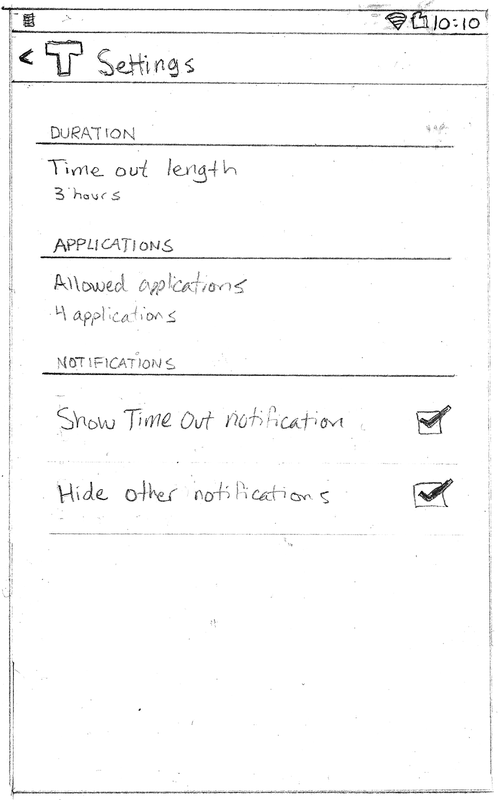 Most apps want a large serving of your personal time. In contrast, not only does Time Out! not want your time, it wants to prevent your other apps from over-indulging as well. It's Saturday. You want some peace and quiet after a hectic week but your social media notifications will not cease. Open the app, adjust the settings to desired stringency, and press Time Out! You will now be unable to open any apps besides those specifically allowed through the Settings screen until the timer runs out. It's Monday. You have a ton of work to catch up on but, again, your social media notifications will not cease. Open the app, adjust the settings to desired stringency, and press Time Out! You will now be unable to open any apps besides those specifically allowed through the Settings screen until the timer runs out. There are really only 3 activities needed for basic implementation. I haven't given them official names yet but they can be seen below. Additionally, I created a chart to keep track of the activity flow. Even though it is still quite simple, it's nice to see the relationships in clear terms. 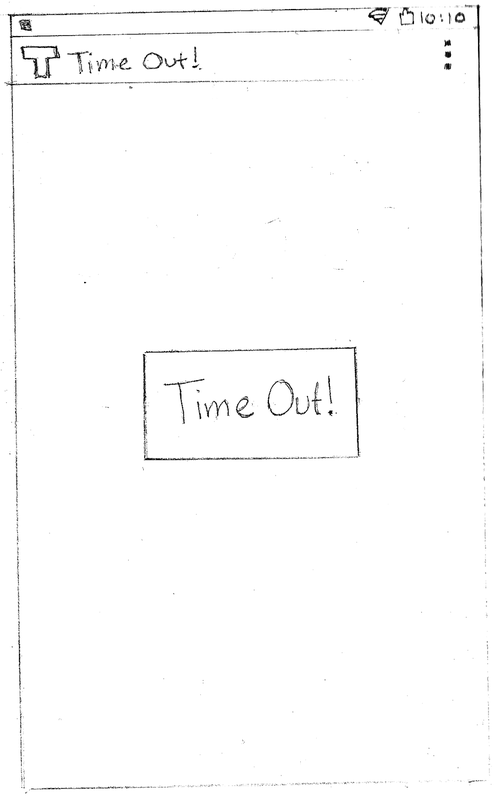 An important theme of Time Out! is simplicity, and that's what I'm aiming for in the design of the activities. Keeping the settings compartmentalized within the official Settings menu, only having an "on" button, and keeping most of the app's inner workings invisible to the user just adds to this theme. The app will also include an optional, persistent notification which will keep the countdown accessible even while you use other allowed apps. 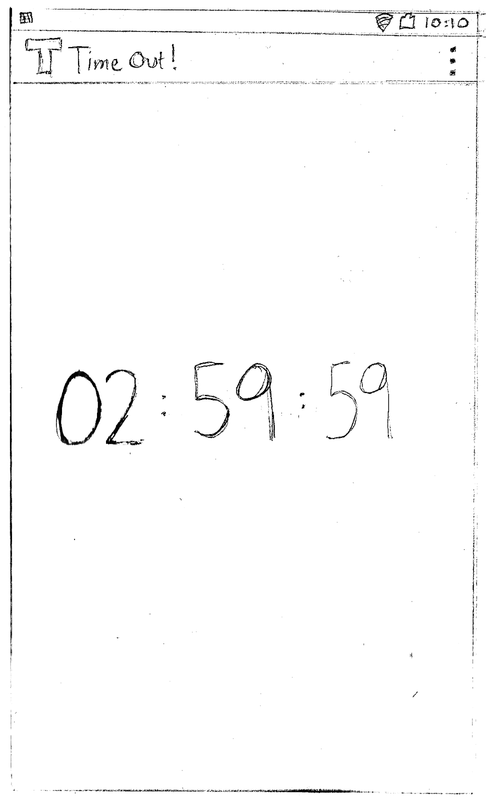 I have done a bit of programming so far: most of the design elements for the initial activity are in place, the persistent notification is working (though with one slight issue), and the countdown timer is counting.